Recently Xiaomi released the MIUI 8 Global Stable ROM for Redmi 1S, Mi 2/2S, Mi 4i, Redmi Note 3G, Redmi Note 4G and added one more devices in the list Redmi Note 3. Yes, finally Redmi Note 3 receives the MIUI 8 update. Xiaomi released the MIUI 8 ROM with many new features and improvements. Company highly recommended updating your device to MIUI 8. 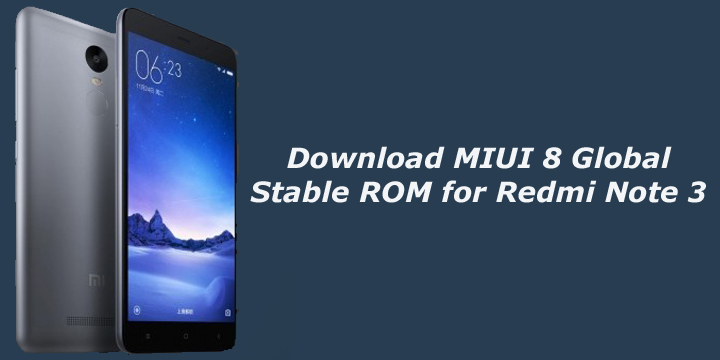 Download MIUI 8 Global Stable ROM for Redmi Note 3 from below. Xiaomi already released the MIUI 8 Global Beta ROM, which already getting so much popularity, and now you can download MIUI 8 Global Stable ROM. The MIUI 8 v0.1.0 Stable ROM features scrolling Screenshots, Quick Ball, Dual Space, MIUI Caller ID, and with many improvements. You can check full MIUI 8 Global Stable ROM Features and Changelogs from below. Download MIUI 8 Global Stable ROM for Redmi Note 3 from below. Also check how to install Google Play Store on MIUI 8. Download MIUI 8 Global Stable ROM for Redmi Note 3 and flash it via recovery. We will update the post with fastboot ROM as soon as its available.